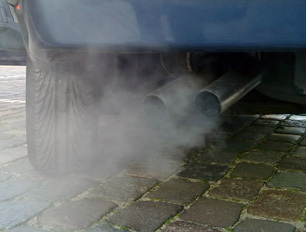 Exposure to PAHs may occur through car exhaust, cigarette smoke, and some cooked foods. Polynuclear aromatic hydrocarbons (PAHs) are a diverse group of chemical compounds with a similar arrangement of carbon and hydrogen atoms, formed as a result of incomplete combustion. They almost always form as a result of human activity, including coal and oil processing, industrial uses, automobiles, heating, tobacco smoke and some common cooking methods. Although there are several PAHs, the World Health Organization reports that the four most commonly found in drinking water are fluoranthene (most common), phenanthrene, pyrene, and anthracene, and the most studied—due to its health risks—is benzo(a)pyrene. Due to low water solubility and the ability to readily adsorb to particulate, PAHs are rarely a water treatment concern. They arrive in drinking water primarily through old pipes treated with coal tar or asphalt anti-corrosive treatments. The most common means of human exposure are char-broiled and smoked foods, and the inhalation of polluted air and cigarette smoke. Several polynuclear aromatic hydrocarbons are known carcinogens. The EPA reports that poisoning can result in suppression of the immune system and damage red blood cells, leading to anemia. Long term exposure to large amounts can lead to developmental and reproductive issues, and harmful effects on the kidney and liver. The EPA recommends granular activated carbon (GAC) for the treatment of polynuclear aromatic hydrocarbons.